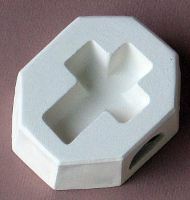 Casting molds can be used as a jewelry mold or design mold and are the newest casting molds offered by Firelite Forms. Frit or scrap glass can be used to fill this mold to cast your design. Drill a hole in finished glass for a pendant or wrap your glass for an added extra.